Are you a Democrat overjoyed that the congressional gerrymandering battle coming to a head this week in Pennsylvania may seem to be going your party's way? Well then. A bit of friendly advice. Pa. Republicans have proposed a new congressional map. Democrats say it's still gerrymandered. Step away from the adrenaline. Because whether this epic battle ends in the next few days or weeks with maps that look good for your party or not, 2018 will be a bloody electoral year. And Democrats already are drawing blood from each other instead of the other party. It's happening as Democrats still work to claw their way out of the colossal mess their leaders made of the party at the grassroots due to years of neglect and apathy. For years, they basically stopped running real candidates in tons of state and local races while Republicans assembled a political killing machine. With this focus, the GOP won two-thirds of the nation's legislatures — and the right to draw the very congressional districts under fire in Pennsylvania and beyond. Democrats got a boost in November with huge successes in local and county races across the suburbs of Philadelphia. 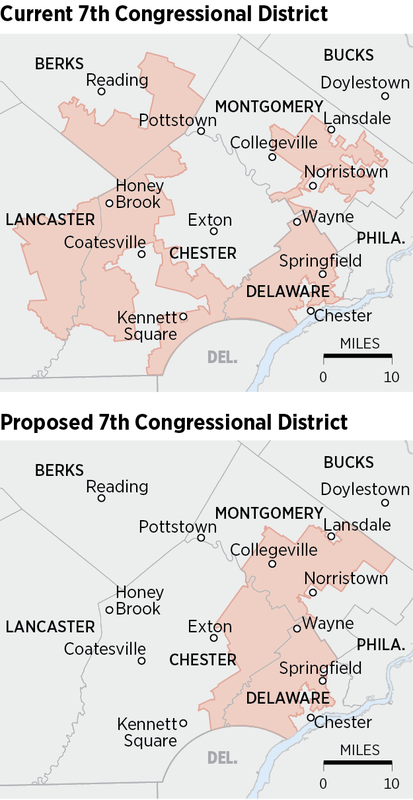 The 7th Congressional District in Pennsylvania, currently held by Republican Pat Meehan, has been heavily criticized for its bizarre shape. A proposed new boundary drawn by Republican leaders is much more compact. Democrats say the map is still unconstitutionally skewed in favor of the GOP. But unity remains elusive for the party whose ugly presidential primary in 2016 led to Hillary Clinton's being mortally damaged on Election Day after Bernie Sanders supporters — embittered that the party had shafted their man — left her high and dry. A similar rift may be forming in Pennsylvania just as Democrats prepare for this year's congressional, gubernatorial, and state legislative races. Given how they hope to take back control of the U.S. House, this is not so great timing to be having another family feud. On Tuesday, candidates hoping for a spot on the primary ballot began circulating nominating petitions requiring enough signatures for the privilege to run. The good news: The number of people in line to run is huge — the party hasn't seen anything like it in years. The bad news: There's been grumbling by restive newcomers, whether in Bucks or Delaware Counties, that they want a say over who runs in big races. The very idea that the party would be choosing someone based on "electability" is, to some, repulsive. The newcomers, many of whom are women disgusted with President Trump, gave the party an injection of new life. Now, they want to see people like them — not party favorites — backed to run for the state's 18 congressional seats. A lot is at stake. A whopping 13 of the state's delegation are Republicans thanks in no small measure to gerrymandering. Oh — and not a single one of Pennsylvania's 18 congressmen is a woman. The noise from newbies is causing hand-wringing among party officials even as the party watches closely as Republicans tangle with Wolf and the Supreme Court over what the state's congressional districts will look like before primary day. "This is what we're grappling with," State Rep. Leanne Krueger-Braneky of Delaware County told me in an interview Wednesday. Krueger-Braneky is a rising star and cochair of the state House Democratic Campaign Committee. A huge force working to recruit women candidates statewide, she has been meeting to help screen potential candidates for the Seventh Congressional District held by Republican Rep. Pat Meehan. The line of people looking to run against Meehan is so long it's almost like the line for Space Mountain at Disney World. "I'm the only Democrat in Delaware County not running for Congress," Krueger-Braneky said in a bit of a wisecrack. And that was even before Meehan scorched his incumbency last month with a sexual-harassment scandal defense involving the words soul mate. Krueger-Braneky says these people need to be listened to, can't be alienated. And yet, the party needs to be shrewd in backing candidates who can raise money to match the ferocious GOP fund-raising machine. But are others in the party treading as carefully? State Democratic Party Chairman Marcel Groen found out the hard way that old ways do not work with the party's new members. The Montgomery County kingmaker resigned as party chief earlier this month amid criticism over his less-than-zero-tolerance response to sexual-harassment allegations involving Democrats in the state. Women and progressives were furious that he did not share the same outrage as the governor over recent revelations of alleged misconduct involving several party veterans in the state legislature. At a state party meeting Friday in Harrisburg, leading elected Democrats did not dwell on the turbulence. Krueger-Braneky was among the speakers. "The message that every one of us carried at the podium," she said, "is that we need to fight." Now, if only they could stop aiming their fire at each other.